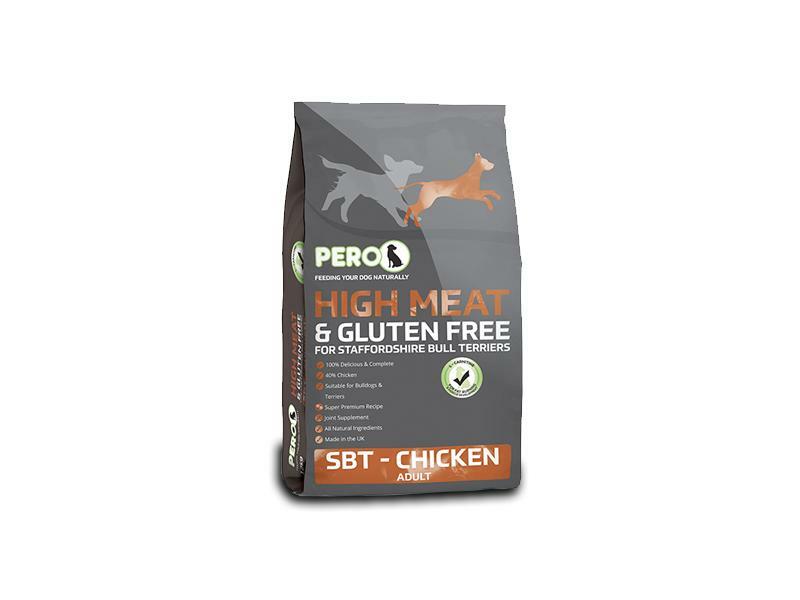 Pero Staffordshire Bull Terrier food, or more lovingly called SBT has been a firm favourite for many years. With a recipe containing 40% chicken, this is a super premium food ideally suited to staffies, terriers and bulldog breeds. Its wheat gluten free qualities are ideal for managing skin and sensitive digestive issues. The inclusion of the fat burning amino acid L-Carnitine helps keep your dog looking lean and muscular Complimented with glucosamine and chondroitin, your dogs joints are also cared for. This recipe also contains linseed and fish oil which contains high levels of omega 3 fatty acids, this will benefit your dogs skin and coat condition. NOTE: This product is changing it's packaging and name. It still has the same recipe however. Composition: Chicken 40% (Fresh Chicken 20%, Poultry Meal 20%), Maize, Oats, Beet Pulp, Linseed, Brewers Yeast, Poultry Oil, Chicken Gravy, Whole Egg Powder, Minerals, Fish oil, Glucosamine (150 mg/kg), Chondroitin (150 mg/kg), MSM (150 mg/kg). Crude Protein 26%; Crude Fat 12%; Crude Ash 7%; Crude Fibres 3.5%. Below are some recent questions we've received regarding Pero High Meat & Gluten Free SBT – Chicken, including answers from our team. Is Alfie boy lacking certain nutrients in his food as we court him picking up his poo once. Some dogs (especially young ones) will eat some of their own or other dogs' pooh on occasions. Indeed for some it becomes a habit, revolting though it seems to us. It actually does them no harm generally and in the wild, it would be completely normal for them to eat some herbivore pooh quite often. That is probably instinctive behaviour designed to add certain nutrients to the diet, but it does not happen because they feel short of something. It is more akin to a person who likes to eat something sweet - it just tastes nice. If your dog is not digesting the food very well, it might still taste like it is worth eating to your dog, so switching to a different diet might help, but this is trial and error. If it has happened just once, I would not worry about it. If it persists, switching to a diet with different base ingredients (read the labels) might help. Is the above food available for puppies or is it just fir when they turn 1? Pero Staffordshire Bull Terrier food is suitable for dogs from 1 years of age. Why is the SBT food so much more than the Labrador one? (At the time of writing) The Staffordshire Bull Terrier 12kg bag is £28.43 which works out to be £2.36 per kilogram. Unfortunately there isn't a 12kg bag of Labrador Life to compare directly to the Staffordshire 12kg but the sizes available are a similar price per kilogram. Bigger bags usually work out to be cheaper per kilogram than smaller bags of the same food. I hope this helps.